It’s official: Joe Hart has finalised his season-long loan move to Serie A club Torino. Joe Hart has now officially completed his loan move to Italian club Torino after weeks of speculation surrounding his future at Manchester City. The goalkeeper was deemed surplus to requirements by new boss Pep Guardiola, who has wasted little time in showing England’s number one the exit door after a decade at the Etihad Stadium. Hart attracted interest from Sunderland and Everton during his period of uncertainty, but the 29-year-old opted for a new challenge in Serie A which will see him link up again with former City coach Attilio Lombardo. For sure, the move leaves a big gap at City. 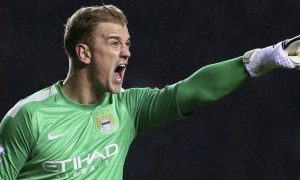 Hart was part of the spine of one of City’s most successful teams, winning two Premier League titles, one FA Cup and two League Cups along the way. Hart made close to 350 appearances in his ten years at the club and his absence will be felt for a while. Hart leaves for Italy on a season-long loan deal and what happens after that is anyone’s guess, but for now all we can say is, good luck Joe! It’s been a pleasure.